My question pertains to the application of Hadd's Approach to Distance Training for a marathon runner to runners in the 800/1600/3200 distances. After reading Hadd's Approach, it is clear that the runners I coach, while they appear aerobically fit, have trained at speeds that are too fast. Thus, during xc, when they run 4 and 5K distances, they are going anaerobically to soon, hitting LT, and dying off. Now we are in track, and I see the same thing occurring in greater distances. For instance, one runner with a 2:19 800m time should be able to run 4:49 1600 and a 10:40 3200, also 17:37 5K. But the times are 5:16 for 1600, 12:00 for a 3200, and a 5K pr of 19:38. So...My question pertains to extrapolating the methods in Hadd for a marathon runner to a mid-distance runner. In other words, in Hadd, the runner of example had a 170 HR beginning marathon pace, and the HR he began with was 145 and 155-60 and progressively built from there. However, a marathon is mostly an aerobic race. So for an 800 runner, they are going to hit LT much sooner than a marathon runner, a little later in the 1600 and so on. 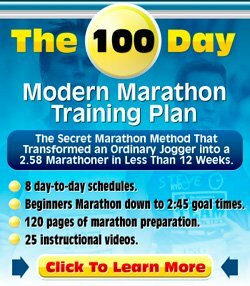 Will the marathon approach in Hadd work for the mid-distance runner or do they need to extrapolate from Hadd and adjust to a higher HR and then run at HR's at the recommended beats sub max? Thanks for your question about Hadd's Approach to Distance Training, a string of thoughts posted by this running trainer, Hadd, on one of the major running forums a number of years back. You are right, a marathon is mostly/completely an aerobic race. But any race from 800 metres and up is mostly an aerobic race. Sure, speed is very important in the shorter distances as well, but you don't get far if you have got speed, but no stamina. The Hadd approach is a method that works to build an excellent base and to increase your lactic acid threshold, regardless of whether you are a marathon runner, half marathon runner or run shorter distances. When you are able to lift your lactic acid threshold, then you will be able to run faster without your legs getting heavy. This helps in any race, whether it is an 800 metre race or a marathon. Looking at the core of the approach described in the e-book, the main idea about Hadd's approach for base building is to do easy runs, but also to run just below, at and just above your lactic acid threshold. It is an approach Lance Amstrong uses in his bike riding and many top-triathletes use in their swimming, bike riding and running. If you know that your legs get heavy when you run 7:05 miles, then run lots of 7:15 miles. Do this enough and after a while your legs do not get heavy at 7:05 miles anymore. It sounds like more base building and working on the lactic acid threshold would be beneficial for the kids you work with. The times you mention are very typical of many, many runners. Many people simply never really develop their base fully because of inconsistent training or switching back and forth between training approaches. Many people also do their long/easy runs too fast and their intensity work too slow. I would expect that if you use the exact same approach as described in the e-book, and do so very consistently over a prolonged period of time, then you will be able to get quite some improvement. However it is probably best applied in the off-season, in preparation for the running season. You should not need to extrapolate any of the work in the e-book, the core idea is to run long, run easy and around lactic acid threshold pace. For more information how to find the right paces, check out the Zoladz Method of Heart Rate Monitor Training and the Karvonen Method of Heart Rate Monitor Training. One addition I should mention: Hadd's approach is a great, great method for base building. A fantastic running training book which explains a lot more about all the different running speeds and how to combine them (including running training templates for any race of 800 metres and up) is Daniels' Running Formula. The running training templates in that book are also geared towards high school / university situations where you will have multiple races in a season instead of that one goal race. Daniels also starts of with a base running period, but in the racing period or closer towards races he will include faster running as well.